I will get back to talking about my trip to France but this is just a short intermission to bring you a little peek into what’s going on at the local Farmers’ Markets. Fall is really settling in here in Seattle – it’s been raining (that is just a little too early, if you ask me! ); the overnight temps are down in the 40s; and the days seem to be getting shorter in leaps and bounds. But there is one good thing – fall produce. I love the earthy colors, the rich and hearty flavors, the solid weight of it. 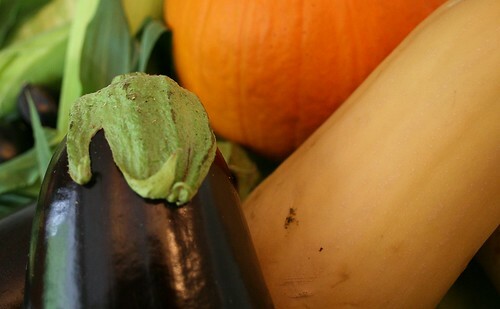 This weekend while stopping at the U-District Farmers’ Market I found lots of treasures: pumpkins and squash that will find their way into soups, pasta and maybe quick breads; eggplant for baked dishes like moussaka; corn to eat right off the cob. Even the lettuce I picked up was a bright red – as if choosing to wear its fall wardrobe, too. Pears and apples were also in abundance. Yes, it’s definitely fall. Nice blog! those pictures are making me hungry!